Keep up to date with Dundee Soup through our website and social media, you can also sign up on this mailing list here and join the conversation through #DundeeSoup. If the cost is a barrier to attending this event, just let us know. Dundee Soup is a social event supporting local community-based projects and creating new connections in the city. We’re delighted to let you know that the next Dundee Soup will happen on Wednesday 8th May, from 6pm – 8pm, at V&A Dundee, as part of Dundee Design Month 2019. Dundee Soups are run by Creative Dundee and The Circle. This event is kindly hosted and sponsored by V&A Dundee. For a suggested donation of £5 or more, you can join us on the night, receive a simple soup supper and hear four short presentations from local people with creative ideas to benefit their community – these can range from art, design, urban agriculture, social justice, social entrepreneurs, education, technology and much more. At the end of the night, everyone gives their donations directly to their preferred projects! Dundee Soup dinners are open to anyone – whether you need help for an idea that could benefit the Dundee community or you want to support a project that aims to tackle local challenges! Anyone who has an idea to benefit Dundee’s communities can pitch – whether you are an individual, small team or community group. With a special focus on design, we’re looking forward to hear from people who want to use design in their community – in relation to space, organisational change, food sharing, human well-being or energy efficiency, to name a few. “Good design is all about solving problems and improving people’s lives – not just by changing the way things look, but the way things work.” – Peter Nurick of V&A Dundee. “Dundee Soup gives micro-grants to creative projects which benefit the Dundee community. The event offers a safe space, a platform to connect and collaborate. This is a democratic experiment where people come forward with creative ideas to benefit their community and get support from others.” – Claire Dufour of Creative Dundee. To have a chance to pitch your idea on the night, fill out the application form below or click here by April 21st, midnight. If you would like a paper copy of the application, you can pick a copy up from The Circle or V&A Dundee’s receptions. This event is produced in partnership between Creative Dundee and The Circle for kindly coordinating Dundee Soup. Thanks to Shona Littlejohn for helping kick-start the first Dundee Soup to happen in the city in April 2017. See previous Dundee Soup projects here. 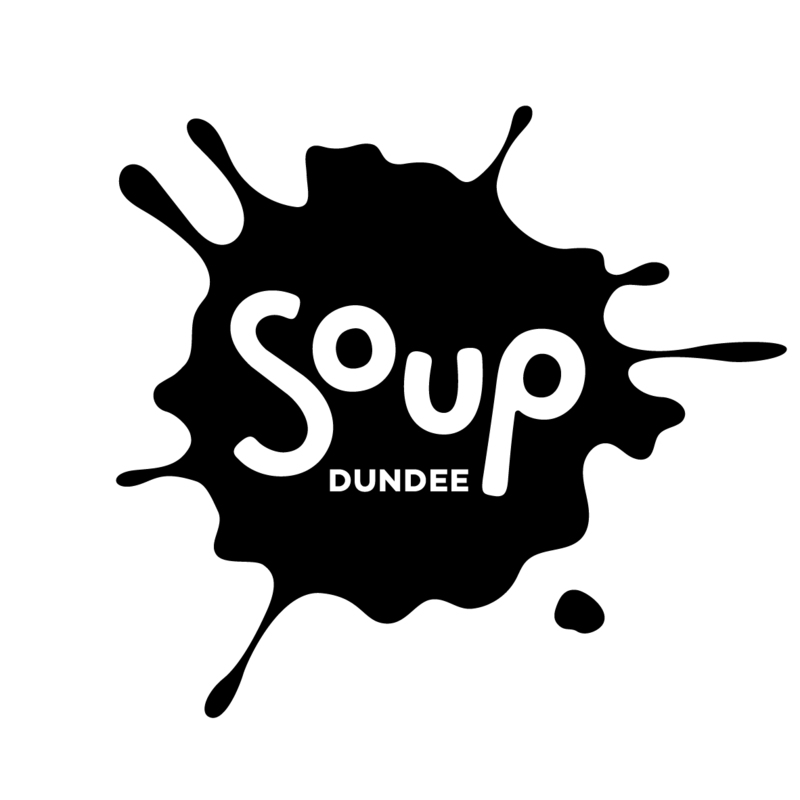 If you are interested in hosting a Dundee Soup in the future, sponsor the supper, play some music, or something else on the night then get in touch – we’d love to hear from you: news@creativedundee.com. Huge thanks to Allison Declercq for making this video above. Check her work here! The first SOUP was developed in Detroit in 2010 with a group of artists’ friends gathered around a dinner to share ideas about art challenges, finding innovative solutions and imperfect ideas for projects that were hard to discover funding for. Over the years, Detroit SOUP has moved from funding artists to a wide variety of community members that need a little money to start their projects and the challenging ideas pushed people to think about the city in different ways. “It’s a little bit of funding, it’s a lot more empowering and it’s even more about connectivity.” – Amy Kaherl, Detroit Soup founder. Find out more about Detroit Soup here. …would you consider becoming one of our Amps Supporters? Besides helping us connect and amplify creativity in the city, you get access to lots of perks, like reduced-priced Pecha Kucha tickets, meet-ups with other Amps and eligibility to apply for our Community Ideas Fund – each subscription makes the fund bigger. Find out more and join the community here!